Animals escaping from an erupting volcano 235 million years ago in northwestern Argentina. 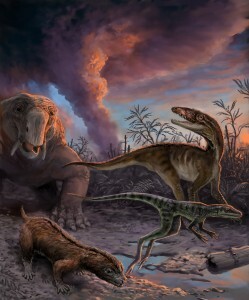 These species, found as fossils in the Chañares Formation, include early mammal relatives (the dicynodont Dinodontosaurus in the left background, and the cynodont Massetognathus in the left foreground) and early dinosaur precursors (Lewisuchus in the right background, and Lagerpeton in the right foreground). 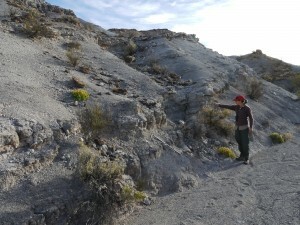 By measuring radioactive isotopes in zircons crystals from the volcanic ash, scientists were able to determine the precise age of this fossil assemblage. 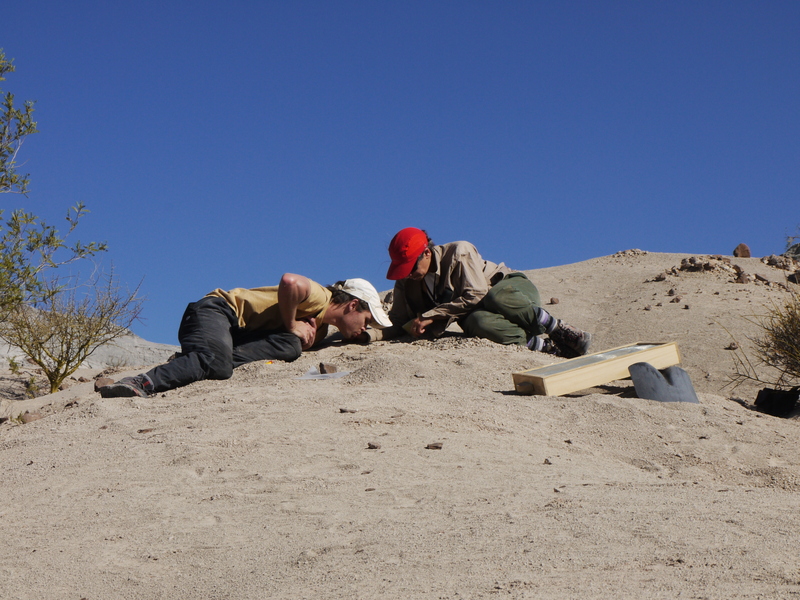 Co-author Adriana Mancuso (right) and Juan Martín Leardi (left) excavate the skeleton of the early mammal relative Massetognathus. 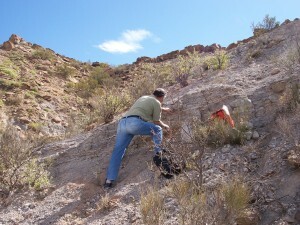 This was also the site of one of the dated samples in the study. 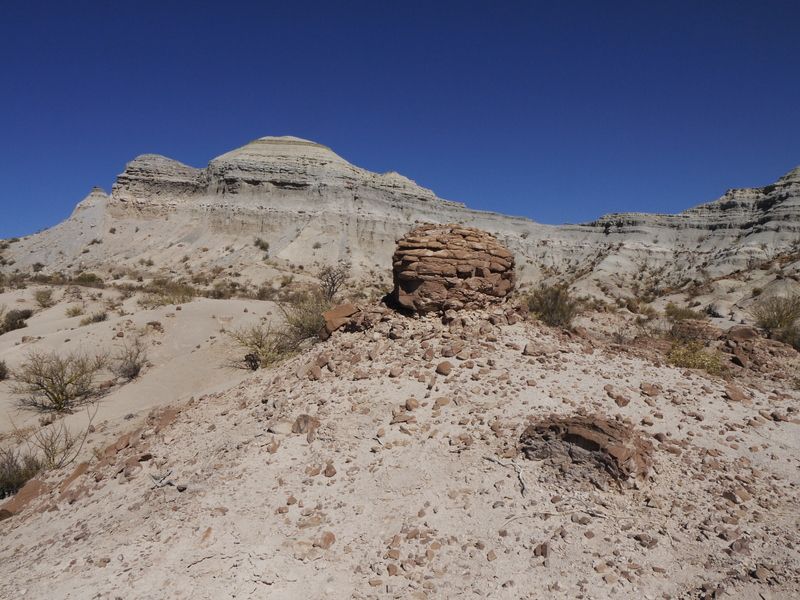 The Chañares Formation is an approximately 75-meter-thick-(250-foot) geologic formation comprised of sediments deposited by rivers, streams and lakes during the Triassic Period in present-day La Rioja Province, northwestern Argentina. 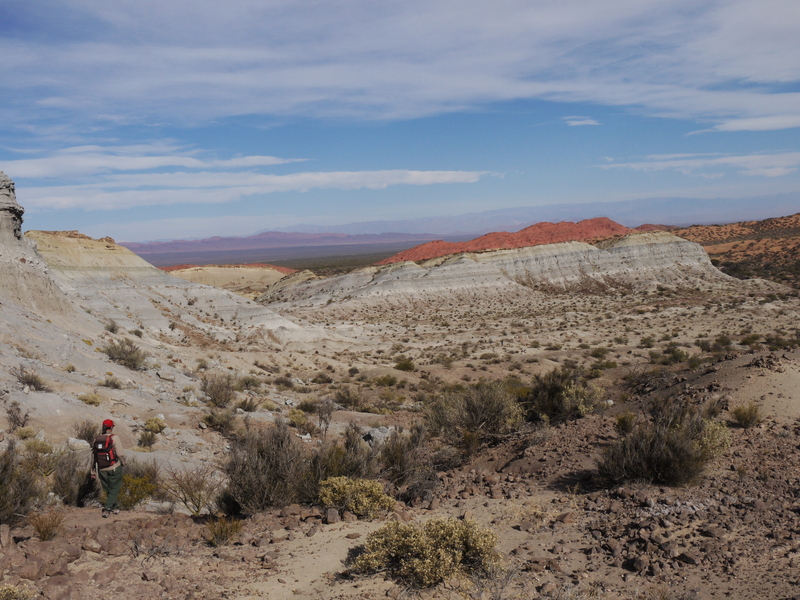 Today the Chañares Formation’s landscape looks reminiscent of southern Utah — high desert badlands. 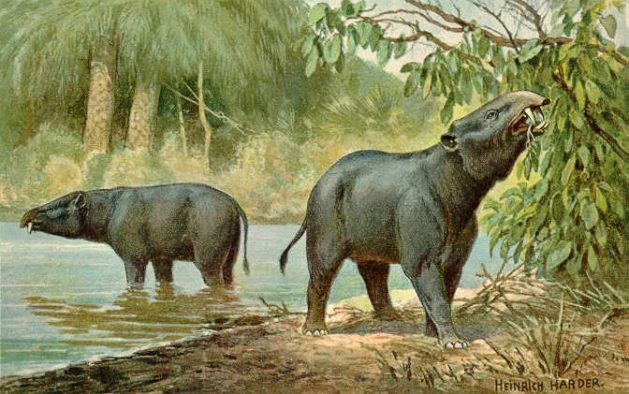 Back when dinosauromorphs roamed, however, the Chañares Formation was more tropical and lush. At that point in time the Earth was in a hothouse state—extremely warm without any polar ice caps and high levels of carbon dioxide in the atmosphere. 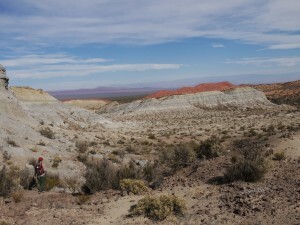 Co-author Adriana Mancuso (far left) investigates badlands of the Chañares Formation, deposited 236 to 234 million years ago in what is now Talampaya National Park, Argentina. 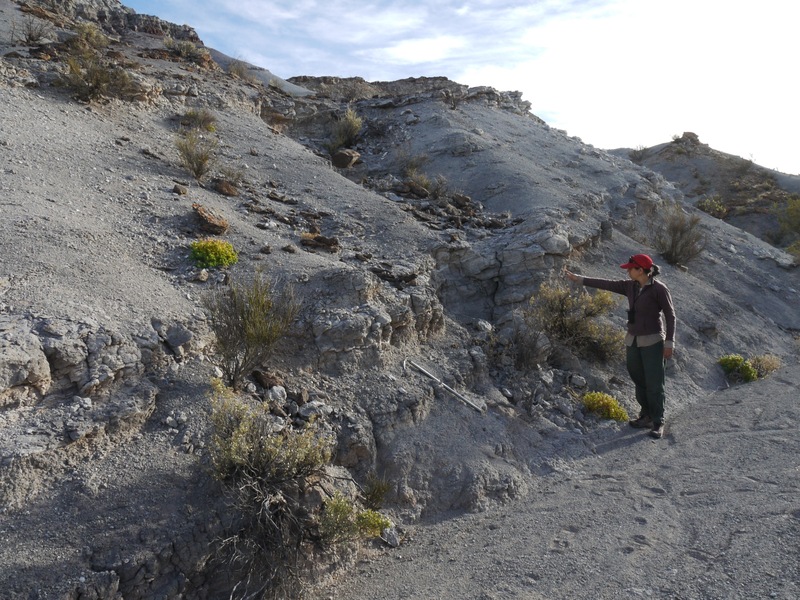 Co-author Adriana Mancuso (right) points to a volcanic ash layer (tuff) in the Chañares Formation that was sampled for radioisotopic dating. Citation: C.A. Marsicano, R.B. 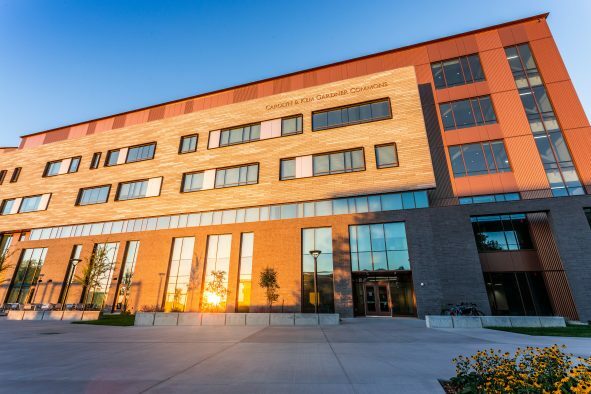 Irmis, A.C. Mancuso, R. Mundil, and F. Chemale. 2015. The precise temporal calibration of dinosaur origins. Proceedings of the National Academy of Sciences, DOI: 10.1073/pnas.1512541112. Co-author Farid Chemale samples a volcanic ash layer (tuff) in the Chañares Formation for radioisotopic dating. 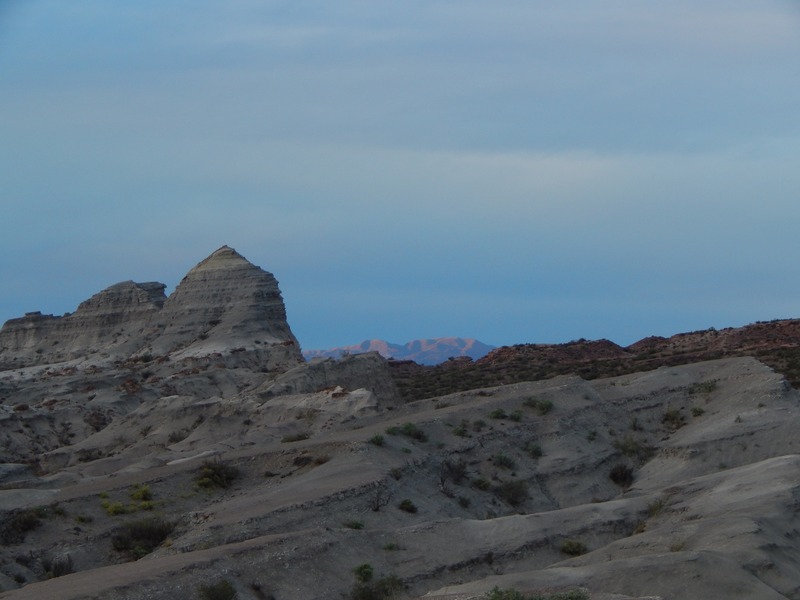 Dusk settles in over badlands of the Chañares Formation in Talampaya National Park, Argentina. 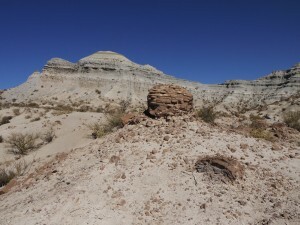 The rocks of the Chañares Formation contain a wealth of fossils from the Triassic Period, which are often preserved in large concretions (foreground).